1950’s The Asphalt Jungle directed by John Huston is without a doubt the prototype for every crime heist film that has come afterwards. Jean-Pierre Melville referred to it as “that masterpiece by John Huston” in relationship to its breadth of relationship variants between the cops and criminals. So much if The Asphalt Jungle’s dramaturgy has been reused and directly remade that its impact today is defused, but from its 11-minute long nail-biting bank heist to its formulating of the “gang” to pull the heist off in the first place, these prototypical elements can be seen in almost every crime and heist film like Rififi, Oceans 11, Melville’s own Le cercle rouge, or more contemporary fare such as The Bank Job. 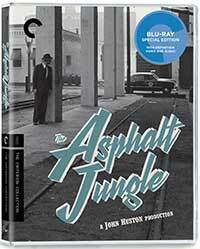 In The Asphalt Jungle, Huston stuck close to the original novel from W.R. Burnett to craft much of this film’s story about a group of downtrodden underworld criminal’s in Cincinnati who are brought together by a supposed criminal mastermind, Doc Erwin Riedenschneider (Sam Jaffe), fresh out of prison and looking to score big with one last back heist he swears will mint all involved a fortune. Going to his friend and neurotically nervous (“money makes me sweat, that’s the way I am”) bookie Cobby (Marc Lawrence) for help, Cobby brings in the nearly bankrupt yet “respectable” lawyer Alonzo D. Emmerich (Louis Calhern) to help them finance the endeavor and fence what is expected to be a large amount of jewels. Doc then recruits local washed up thug Dix Handley (Sterling Hayden) who wastes all his money betting on horses and commiserating about his family’s golden days being big time horse breeders, professional safecracker Louis Ciavelli (Anthony Caruso), and the hunch-backed cafe owner and cat lover Gus (James Whitmore) to be the getaway driver. Doc has the plans all laid out and blueprinted down to the second, and in one of the great on-screen heist scenes ever laid to film, John Huston and cinematographer Harold Rosson create an 11-minutes of intense, edge-of-the-seat, nail-biting suspense. Rosson was not normally known as a particularly stylistic cinematographer, most of his work being on the rather bland, bright, standard color musicals like Singin’ in the Rain or On the Town, but he did occasionally do some more artistically adventurous work, and here his noirish filming techniques, high contrasts and odd framings like having an actor right up close to the camera and another far in the background results in a very intense film and unique looking film. This intensity of look found by Rosson was coupled with the screenplay by Huston and Ben Maddow that gave a frank assessment of the criminal underworld and neither glorified or apologized for it, after all, as a famous line from the film goes crime is just “a left-handed form of human endeavor”. For 1950, this bleak look and the inevitability of criminality and its visceral consequences must surely have shocked the viewing public. None of the criminals in The Asphalt Jungle was really just a crook or “thug” just for the sake of it. Each was put into bad circumstances that bore out their need to turn to criminality. Dix’s lost family history and his dreams of returning home to start a horse farm in the country, Gus’ disability and becoming a social pariah treated like a “dirty cripple” all his life leading him to want something better for himself than the lonely the dive café he runs, or Emmerich’s bad business dealing leaving him cash-strapped and in with bad people. Even the lines of justice blur in The Asphalt Jungle as Cobby finds himself entangled with a crooked cop who lets his bookie business slide for a little money on the side. These are just more of the moral ambiguities that Huston directed with an arm’s length precision in this groundbreaking crime thriller. The Asphalt Jungle arrives on Blu-ray with its original 1.37:1 aspect ratio intact. This is a new 2K digital transfer taken from a 35mm fine-grain master positive done on a Lasergraphics Director film scanner. Restoration work was done by L’Immagine Ritrovata in Bologna, Italy. DaVinci’s Revival was employed to remove thousands of instances of dirt, debris, scratches, splices, and warps manually while Digital Vision’’s Phoenix was used for jitter, flicker, small dirt, grain, and noise management. In the end we get a pretty stunning AVC 1080p encodement on Blu-ray with crisp overall texture and a natural looking layer of grain. The stark noir contrasts really pop nicely, although there are still some areas in the shadows that look a tad bit washed out, particularly around the edges of the frames. The original monaural soundtrack for The Asphalt Jungle was remastered from the 35mm optical soundtrack positive and a 35mm composite print. Various audible imperfections in the source were removed manually with Po Tolls HD and iZotope RX. The soundtrack is offered up in a pleasing LPCM 1.0 track on this Blu-ray edition from the Criterion Collection that sounds very good given its age. There is little hiss or crackle to be heard and pops aren’t an issue either. Naturally, given the vintage and limitations of the technology, there is a certain ‘boxiness’ to the overall sound. We get an excellent selection of on-disc supplements with this release, starting with the audio commentary/archival recordings track right through the interviews and various archival featurettes with experts and John Huston himself. The booklet also contains a very readable and interesting essay on the film. 2004 commentary featuring film historian Drew Casper (Postwar Hollywood: 1946-1962) and archival recordings of actor James Whitmore. John Huston (1.37:1; upscaled 1080i/60; 00:00:50) – A brief archival interview excerpt wherein director John Huston discusses The Asphalt Jungle. 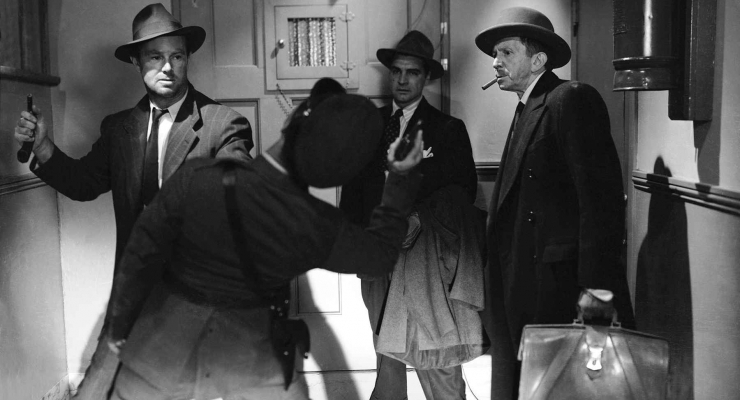 Eddie Muller (1.78:1; 1080p/24; 00:24:10) – In this 2016 Criterion Collection interview, film noir historian Eddie Muller (Dark City: The Lost World of Film Noir) delves into The Asphalt Jungle. John Bailey (1.78:1; 1080p/24; 00:20:12) — Made by the Criterion Collection in 2016, this piece features cinematographer John Bailey addressing the visual techniques employed by director of photography Harold Rosson and director John Huston in The Asphalt Jungle. City Lights (1.33:1; upscaled 1080i/60; 00:48:28) – This October 10, 1979, episode of the television program City Lights features director John Huston discussing his life, work, and family. The Huston Method (1.78:1; 1080p/24; 00:06:01) – In this new piece edited together from several undated interviews conducted by film critic Gideon Bachmann, director John Huston discusses his methods for writing and directing a feature film. Booklet with essay on the film by Geoffrey O’Brien, cast and credits, and information on the transfer. One of the forerunners, if not the sole source of most crime thrillers and heist films today, The Asphalt Jungle is a great moment in cinematic history, a turning point that gathered together a magnificent cast with a great director, a more than competent cinematographer and edgy source material for what would go on to define the crime genre for decades. Criterion Collection’s Bu-ray release is a gorgeous new 2K restoration that must be seen. A groundbreaking crime thriller that set the standard for every heist film that was to follow, 1950's The Asphalt Jungle from director John Huston gets a beautiful new 2K restoration released to Blu-ray from the Criterion Collection.